John D. Jones presented "Flowers, Plants and Opera... Oh, My!" during this exciting talk. John's love of opera started in high school when he volunteered to usher when the Metropolitan Opera made a tour stop in Memphis. As a young singer, he appeared in Opera Memphis productions of Carmen and Tosca as well as serving as production manager for productions of Aida, La bohème, and Ariadne auf Naxos. His nominations have led to recognition on a national scale for Opera Birmingham, supporter Betty Healey, and corporate partner Alabama Power. In 2009, he was named a Champion of the Arts by the Birmingham Chapter of the NAACP. Nancy Raabe of The Birmingham News named him the outstanding arts administrator in his first season, and Birmingham Business Journal tapped him as one of its "Top 40 Under 40" in 2001. He currently serves on the boards of the Birmingham Girls Choir and the Alabama School of Fine Arts. A native of Memphis, John earned a bachelor's degree in business administration from the University of Memphis and a law degree from the University of Mississippi. 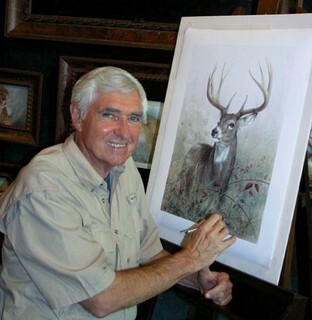 After a career in tropical medicine, Alabama native Larry K. Martin combined his life experience and love of the natural world to become a renowned wildlife artist. With close to 40 years as a painter, his works can be found on hundreds of products including greeting cards, murals and collectible items, and have hung in both Houses of Congress, the National Wildlife Federation, the office of former Governor Bob Riley and many more. Club Members met Larry and heard why he says, "Variety keeps the creativity flowing." Afterwards, the Propagator Club was invited to stay for the Summer Concert Series Kickoff with Alabama Blues legends Earl "Guitar" Williams and "Mr. Gip" Gipson live under the stars! May's Propagator Club Wine Reception by the lake featured fly fishing enthusiast and instructor Bill Thomason. With 55 years of experience, Bill knows his fly fishing. He introduced us to the history of fly fishing, equipment, and talked about all the different places you can fly fish in Alabama. He also showed us a demo in the lake and provided opportunities for Propagator Club members to get their own hands-on experience - for free! Nancy Qualls-Corbett, PhD is a practicing Jungian analyst from Birmingham. She is the author of The Sacred Prostitute: Eternal Aspects of the Feminine, Awakening Woman: Dreams and Individuation, and most recently contributed to The Secrets of Mary Magdalene. She lectures in the U.S. and Europe, and combines her love of mythology and travels by co-leading seminar groups in Greece, Egypt, Italy and France. In this lecture entitled, "The Second Half of Life," Dr. Qualls-Corbett talked about finding our true passions and living outside the boxes we often create for ourselves. 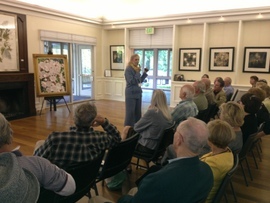 After the presentation, Propagator Club Members had the opportunity to meet botanical artist William Thomas, prior to his exhibit opening at the Gardens. Richard Ryel is a founder and former CEO of International Expeditions, Inc., a nature tourism company focused on natural and cultural resource conservation through education and travel. Just in time for spring, Ryel discussed birds commonly found in Aldridge Gardens.